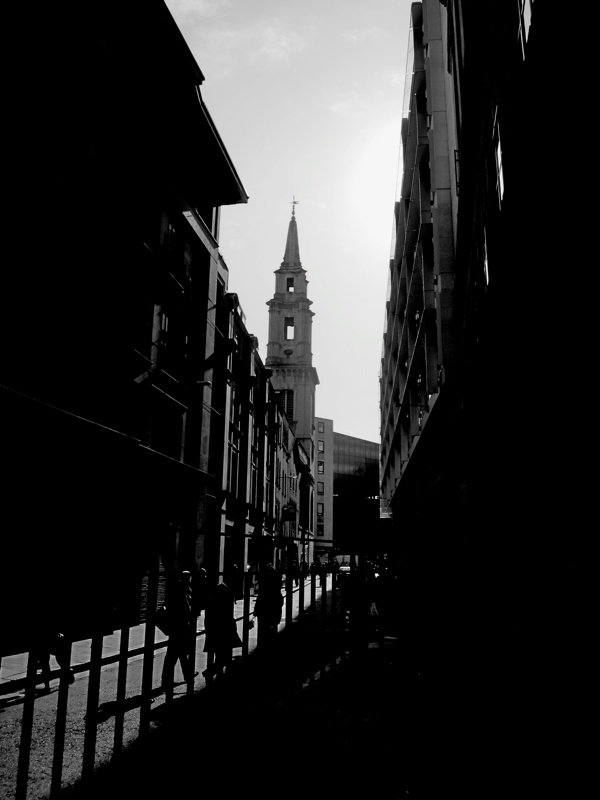 Walking around the City of London and admiring all the church steeples piercing the sky, you might imagine that they just stood there of their own accord. In fact, they need constant attention if they are to continue in use and it is the job of the steeplekeeper to care for them. 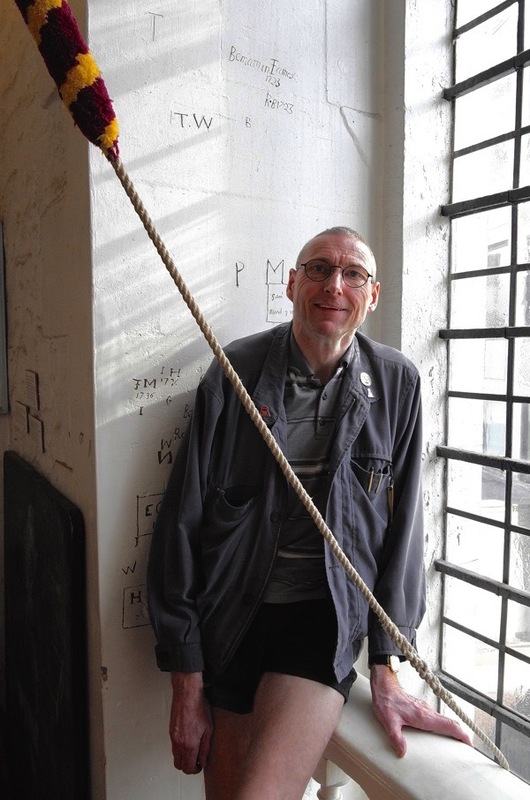 Recently I enjoyed the privilege of visiting the bell ringers in Christopher Wren’s handsome tower of St Vedast’s in Foster Lane next to St Paul’s Cathedral, where I had the pleasure of meeting steeplekeeper Phil Mills. Intrigued to learn more, Phil agreed to arrive early to meet me the following Monday at the church before bell-ringing practice and talk to me about his job. It was fascinating to hear Phil speak with such passion and commitment about his chosen role, revealing a rare glimpse of the elaborate hidden world of bell maintenance and steeplekeeping. “I became a bell ringer at Dorchester Abbey after we moved from Southampton to Oxfordshire in 1986 when I was twenty-two and I stayed a ringer at the Abbey for over thirty years. It took me a year to learn but – once I got the rope handling – I became a member of the Oxford & Diocese Guild of Church Bell Ringers and earned my certificate. Things hastened from there, I became a steeplekeeper in 1987 at twenty-five and I have been with it ever since. Brian White of Whites, Bellhangers of Appleton Ltd, he thought I might make a good steeplekeeper after I got involved with the restoration of the bells at Dorchester Abbey. So I was appointed steeplekeeper with Alf Cooper as my deputy and – between the two of us – we looked after the bells, keeping them in good working order, and looking after the clock, the clock room, the ringing room and the bell chamber, and maintaining everything. Brian White sent me on a tower maintenance course, I did a beginners’ one and then I went on to the more advanced one – and I just headed on from there! I was always very interested in church bells and I used to listen to them a lot in Southampton, especially when I went to family weddings. I was captivated by the sound and I already knew something about the different methods of ringing. Being a steeplekeeper consists of looking after the tower and the bells, and maintaining the interior. Belfry maintenance includes greasing ball bearings and roller pulleys, checking the ropes, greasing the clappers, checking the stays, checking the slider and runner boards, checking the lighting, testing the emergency lighting, checking the tower roof drainage system and checking for ingress of water. The bell ropes also need looking after and many church towers have clock hammers that need to be looked after too. Some towers do not have steeplekeepers, they can go for years and years without having any work done to them, then all of a sudden they go out of action. That is why you need a steeplekeeper. It is a labouring job but as long as we have got facemasks, proper overalls, hard hats and safety precautions, then we are ok. I can do the maintaining of the bells myself and undertake a full maintenance check, although in the case of replacing pulley wheels or clappers, I need to call in a contractor. Sometimes a tower can be a dangerous environment and this is why we have Health & Safety Issues. They only came out a few years ago but now we have to keep ourselves safe from dangerous activities like trying to put a new clapper in and it ending up landing on top of you. These are the things we have to look out for. There was a steeplekeeper at Wallingford for quite a good number of years named Jim. Although he had been ringing for sixty-nine years, knew every single method in the book and how to compose and conduct, he also knew the ways of maintenance. He made a rope warmer by using a piece of drainage pipe, a wooden box, a light bulb and a flex. He wired it all up and put the ropes in there and it warmed them. It even had a timer so it came on before we were going to ring and all the ropes were nice and warm, ready for us. Jim died at seventy-nine and I took over from him. Steeplekeepers do not retire but he had already appointed me to take over, so I continue where he left off. Back in 2006, I decided I was going to get myself a two-hundredth-visited tower because I had visited one hundred and ninety-nine. So I thought, ‘I wonder where I can get my two-hundredth?’ I decided to go to London and I had already seen the ringers at St Vedast’s because they are visible from Foster Lane through the windows of the ringing chamber and I thought, ‘They look a bit friendly.’ I was only down for a promenade concert but I saw them on a Friday doing their lunchtime quarter peals and I thought, ‘Oh this is fantastic, I’ll go along and see what it’s like.’ So I did that on 17th August 2009, I have still got the rail ticket from when I first came here. My instincts were happily right and after a couple of years Tom Lawrence, the ringing master, made me a member of the ringers at St Vedast’s. I visit every Monday from Wallingford for bell-ringing practice. I always check the bells before we do the ringing. I have many favourite towers but St Vedast’s is definitely near the top of my list because it has such a wonderful ring of bells. I love the sound of them as it comes down through the ringing room. It is quite masterful. You hear this lovely sound coming down towards you and this is my favourite ring of six bells. My favourite ring of eight has got to be St Botloph’s Bishopsgate because the tower is on the move, so it wobbles about a lot as the bells are changing. It is seventeen hundred-weight ring of eight bells. The tower moves and it has a lot of character and that is why I enjoy ringing there, that is another favourite. We only get paid for ringing when we do weddings but I am semi-retired and I live on my own in Wallingford. I usually get home about twelve or one o’clock on Monday night. I have been ringing for thirty-four years now and I have visited two-hundred-and-fifty-seven towers. I can barely keep track of all these towers! I have definitely clocked up a lot and I am still visiting new ones. The immense pleasure I get out of it is putting something back into a community – that is why I like to keep the bells going through my work as a steeplekeeper. Thank you for this. I had not heard of this church before but its life reflects all the other historic places of worship scattered around the country. I love the sound of bells, their resonance. In my native Isle of Wight, I occasionally catch the music of bellringing practice in Carisbrooke, magic. Loved meeting this gent – with the added bonus of seeing the inscribed initials. Wonderful. Onward and upward, with bells on. Another Gem from GA the more you find out about London and it’s people the more we are amazed and Phil Mills is an amazing man. 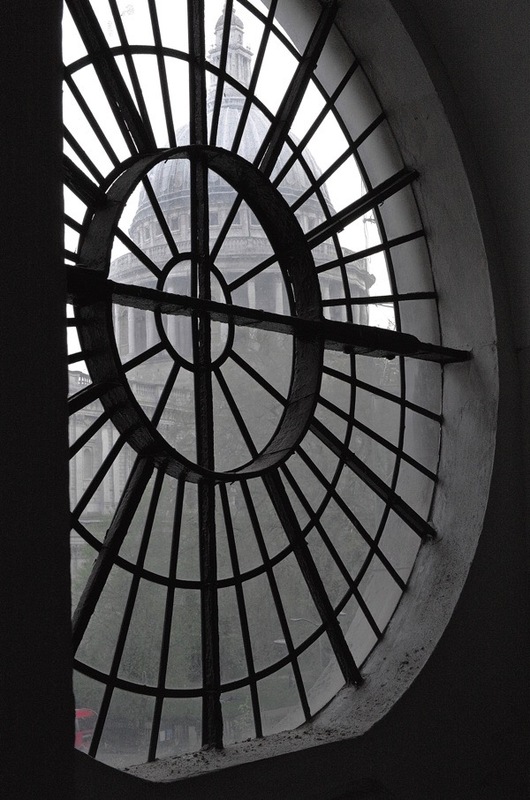 I have been a Freeman at Goldsmiths Hall further down Foster Lane for 46 years so l recommend anyone to visit the Hall where they hold excellent fairs and exhibitions and then along to St. Vedast’s which is wonderful and also go to the lovely paved courtyard next to the church. 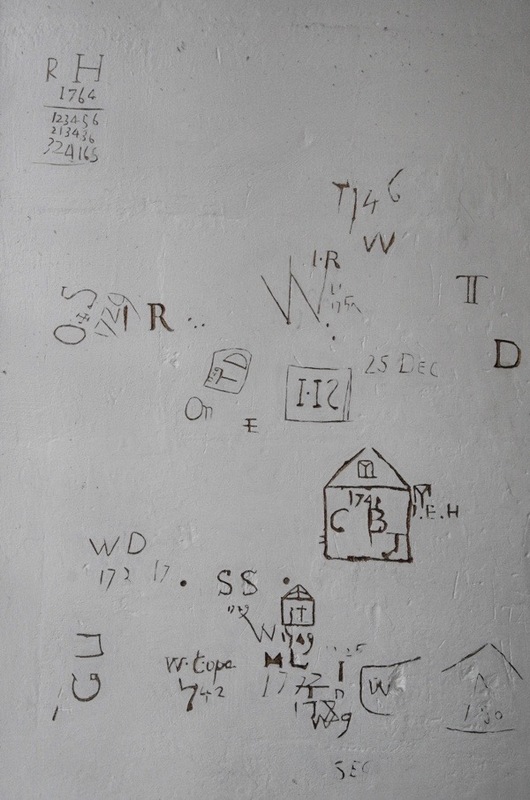 I’m intrigued to see the apotropaic symbols – sometimes referred to as “witch marks” – in amongst the graffiti on the walls. These are the compass drawn “daisy wheels” that can be seen here and also the W. It’s been written that the W is actually VV which stands for Virgo Virginum or Virgin of Virgins which is an invocation of the Virgin Mary against bad luck and evil. 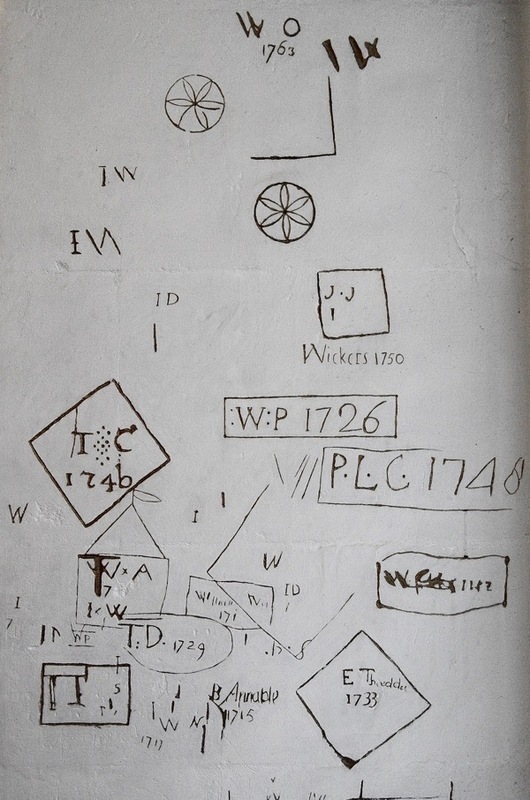 Look for this symbol carved into chimney bressumers of the next Tudor building you visit and the likelihood is that you’ll see them carved there too. All very naughty stuff in post reformation England! 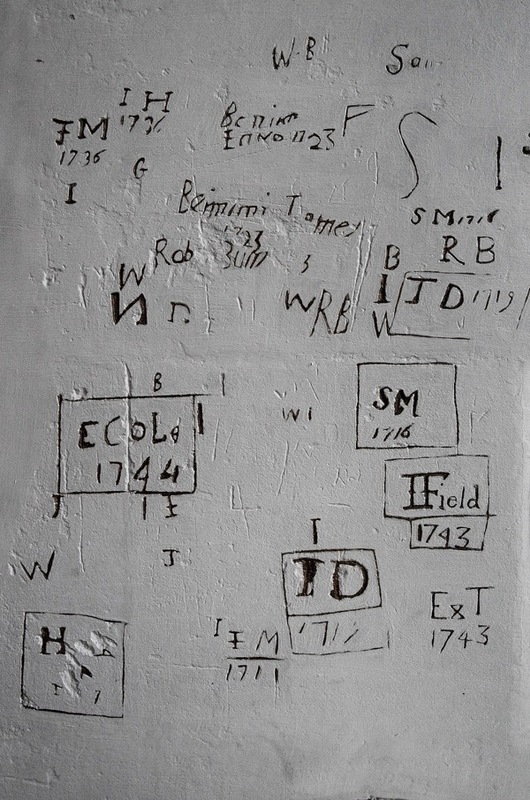 The 18th century is really approaching the end of the period in which we would expect to find those carved into church walls. It is possible that the tower is actually part of the medieval fabric of the church but I’m not sure. Could hear the joyous clanging of bells in every word when I read aloud to share with spouse. However do you find, GA, a perfect documentary for enjoying with every daybreak? You are a brilliant wordsmith conveyor indeed. Thank you for providing such an historical and uplifting musical notation. Fascinating reading about Phil’s passion for bells. My sister Kate learnt to ring at St Lukes Chelsea when barely into her teens, and is still ringing over 60 years later. Due to age and arthritic hands, she can no longer ring a full Peel. For over 30 years she lived in Windsor, and was invited to join the Curfew Tower ringers. As well as ringing every week, she also rang for Royal Weddings, Funerals, and State Occasions. A Curfew Tower ringer can be a lifetime position, but as she and her husband retired to the South West a few years ago, she relinquished her position at the Castle. It was of great benefit to me during those years, as she was always given tickets for special occasions, and I attended more than one annual Garter Ceremony which was a great privilege.